For SpeechMike Premium user with a notebook computer and finding the orginal cable too long and difficult to deal with, this simple replacement cable is the perfect solution. 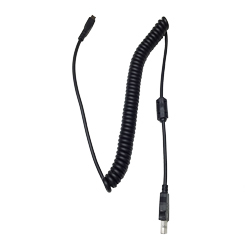 Made specifically for the SpeechMike, this coiled cable can be extended as needed. And otherwise it allow the cable to be largely out of the way. To use this replacement cable, you need simply unplug (pull out) the orginal cable and insert this in its place. It will lock in place, just like the original cable. Finally the cable I need! From Anonymous of Watertown, New York on 12/5/2016 . Definitely get the coiled cord if your workflow involves carrying around a laptop on the go from exam room to exam room with the Philips SpeechMike Premium/Touch. In my experience the Philips SpeechMike Premium Touch is much more accurate than the Nuance PowerMic III. Now that I have the coiled cord for the Philips, I am very happy.